Stereotactic radiosurgery (SRS) could be the answer for many patients suffering from lung cancer. For that reason, the clinical trial is intended to prove a simple hypothesis: Dogs with primary lung tumors can also be safely and effectively treated with image-guided SRS. Interested pet owners or veterinarians are encouraged to visit PetCureOncology.com/ClinicalTrials for details of the study and online application forms. Enrolled patients will be treated at a heavily subsidized cost and pet owners will benefit from free pre-treatment consults and imaging (CT) as well as free post-treatment checkups and follow-up imaging. For entry into the study, candidates must have a primary lung tumor that has not metastasized. A full list of exclusions can be found on the website. Just a few years ago, the significant benefits of SRS were largely available only to human cancer patients. 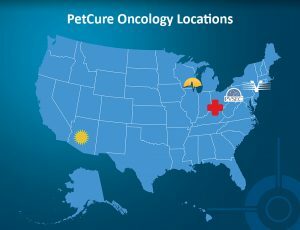 PetCure Oncology has changed that by creating comprehensive veterinary cancer centers that specialize in radiation oncology and SRS. Less than two years since launching its first center, PetCure has emerged as the leading provider of SRS for pets in the country, treating nearly 700 pet patients across what is now a growing, five-site national network. Two-thirds of those patients have been treated with SRS, whose benefits include fewer treatments, shorter treatment times, and minimal side effects.